As forecast on this site three weeks ago*, Kenenisa Bekele, arguably the greatest long distance runner in history has been added to the field for next month’s Berlin Marathon, which already featured Olympic champion and world number one, Eliud Kipchoge, and former world record holder and one of the most consistent elite marathoners of recent years, Wilson Kipsang. It is perhaps the best elite trio in a marathon since the then world record holder, but far lesser known or fancied Khalid Khannouchi upstaged the world famous duo of Paul Tergat and Haile Gebrselassie (in that order on this occasion), breaking his own record by four seconds, with 2.05.38 in London 2002. Notwithstanding their obvious talents, one of the most intriguing factors in this three-way match in Berlin is the advancing years of all three men. Back in the day, it was a mantra at least in UK running circles that you only graduated to marathons and other distance races on the road when you could no longer cut it on the track. That distinction disappeared decades ago, when rewards for big city marathons began to outstrip what could be won by all but the super-elite on the track, ie Geb/Tergat. Nevertheless it remains a touchstone for the ageing competitor to remind him and herself that Carlos Lopes of Portugal won the Olympic marathon in Los Angeles 1984 at age 37; and Constantina Dita of Romania went one better by winning Beijing 2008 at 38! The record books claim that while Bekele and Kipsang are 35 years old, Kipchoge is only 32.  However, when I mentioned in my appreciation of his superlative run (despite being relay-paced) in Monza in May, clocking 2.00.25 that Kipchoge, like Gebrselassie was probably several years older than his official age, I got an intriguing comment on this website from someone who claims to know. He has asked me to take his name off this post, but he was a very good Kenyan runner, though not an international, and in a follow-up email exchange, he had observations on people close to him, information which might interest you. ‘I don’t have tangible evidence on him (Kipchoge) being probably over 35 years but I competed with him in 2001 and he seemed quite older than me. I am 36 years old now, so I can reasonable assume he is older than that. I know a lot of Kenyans who faked their age including my own family members and neighbors. Benjamin Kiplagat (the Ugandan steeplechaser) is from my place and he competed at world junior championships when he was 28 years of age after obtaining Uganda citizenship. Moses Kiptanui is listed to be born 1970 but he was actually born 1968. Ezekiel Kemboi graduated from high school a year before me, so he should be at least 37yrs’. The above is not just for the record, because it is worthy of discussion not only from the perspective of the fairness of junior competition, but perhaps more importantly in its reflection on athletics longevity at an elite level. It is both a challenge and an incentive for those of us who are, ahem, a little more mature….! That said, a certain experience in years, if not in long distance track but at least on the roads (Kipsang never ran serious track) is necessary for marathon success, and world records. Paula Radcliffe, whose 2.15.25 in London 2003 still looks unassailable, was then 29; Khannouchi was 28 and 31, for his Chicago and London world records; current record holder, Dennis Kimetto (2.02.57) was 30; Tergat was 34, and Geb was (allegedly) 34. Notwithstanding the far from remote possibility that some unknown Kenyan or Ethiopian ‘youngster’ may emerge from the bush and beat Kipchoge and Co, the current old boys look likely to give us a fascinating race in Berlin in just over three weeks’ time. I would venture that Kipchoge is unquestionably the world number one in the men’s marathon at the moment. An enfant terrible (allegedly 18), winning the 5000 metres world title, against El Guerrouj and Bekele no less, in Paris 2003, he added Olympic silver and bronze at the same distance, before turning to the road. With seven victories in eight marathons, including Olympic gold last year, and losing only to Kipsang’s world record of 2.03.23 in Berlin 2013, his 2.00.25, whatever the circumstances demonstrated that a sub-two is possible sooner than we thought. However, my spies tell me that the Monza effort took far more out of him than any of his previous marathons. Since he made his marathon debut in Paris 2010, finishing third in 2.07.13, Kipsang has run twice as many marathons as Kipchoge, most impressively winning a series of eleven races, punctuated only by his third place in the London Olympics 2012. He looked en route, if not to a second world record in Berlin last year, then at least a victory in another fast time. 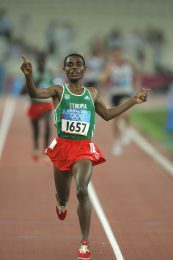 However, Bekele did something which is fast becoming a speciality, ie coming back from the dead. Left behind with three kilometres to run, he rallied to beat Kipsang and record the second fastest time in history, 2.03.03. And although he didn’t win in London earlier this year, something similar happened. Dropping back sharply after halfway, he was well over a minute and a half dozen places in arrears of eventual winner, 24 year old Daniel Wanjiru (no relation to the late lamented Sammy) with ten kilometres to run; yet finished second by nine seconds, and had the race been a kilometre longer, he might well have won. He also has the extraordinary incentive of being bracketed alongside the immortal Zátopek**. No, he’ll never win Olympic gold in the 5000/10,000 metres and marathon inside eight days, as the Czech did in Helsinki 1952. But if he can win some seven seconds faster than last year in Berlin on September 24, then he will be the only man in history to hold world records at 5000/10,000 metres and marathon. ** QUICKSILVER, The Mercurial Emil Zátopek. Excellent piece, as usual. On Kenyans’ uncertain ages, a more innocent explanation is suggested in my forthcoming book. In 1988, Kip Kosgei may have been the first runner over-40 to medal (3rd) in the World Cross-Country – or not. He didn’t know his age for sure, he told me, when we ran together in Auckland’s Cornwall Park a few days before the champs, because he and other kids were several times taken out of school when the family farms needed them, and were always put back in the same class they had left. Thus classes had a mix of ages, and as it was of no significance they tended to lose track. I have no other authority, but Kosgei had no agenda, so it’s a likely explanation of some cases. I’d corroborate your view immediately on Kip likely being over 40 in Auckland, Roger. I met him both there and at several other events later. I believe John Bicourt was if not his manager, then very close to him, and may have a contribution on this one. Bekeles inclusion will provide for a great race but I think the attempt on the WR will now be off and the race will be on. Bekele is too dangerous to have anywhere near you with 5kms to go if you have gone out at WR pace and are starting to badly fatigue. Pat, you might find experience with birth certs. in Ethiopia instructive. Applicants were interviewed by the kebele (village or district council). The first question was ‘How old do you want to be?’ They recommended under 18 for US applicants, mid-twenties for those wishing to travel to Italy. They would construct family relationships among strangers (not difficult in a country where, as in Kenya, there is only as limited number of fore- and family names). Evelyn Waugh wrote in the 1930s that the ‘chief Delight of the Abyssian lies in cheating the foreigner’. Has anything changed? Age cheating is not always so innocent as simply not knowing or the manifestation of approximating your age by school grade. In the innocent cases, the ages are off by a year or 2, but there is nothing innocent about athletes in their mid-20s competing in youth and junior competitions. I understand the rationale that a fast ‘young’ East African is more valuable than a fast ‘old’ East African athlete to agents and meet promoters. I also understand the economic realities of how and why East Africans use the youth and junior global championships as a way of announcing themselves as ready to earn money. The unfairness is that have talented true youth athletes from around the world have absolutely no chance of even being competitive against the East African adult athletes. The East Africans would probably win even if they used age appropriate athletes, but the dominate would not be to the point where they are so far ahead of the rest of the world that most countries are simply giving up. One year, half of the top men’s 800m times in the world were run by supposedly 17 year olds, most of whom never ran much faster in their career than they did at age 17. East Africa is pretty much killing the youth and junior global competitions. As of 2017, America and several other countries will not longer be participating in the World Youth Championships and there is already debate about no longer participating the IAAF World Junior Cross Country Championships. Several other countries have already stopped sending teams years ago. Moses Kiptanui was initially listed as being born in 1972, which is why he was able to compete at the 1990 World Junior Championships, where he won the 1500m. I asked him about his birth year a few years later at a Golden Four meeting, and he did indeed tell me it was 1970. That date is generally accepted now, even though it would mean his 1990 victory was illegal. And now his brother says it was 1968. Is there no end to the unreliability of information coming out of Kenya? It doesn’t really matter how old they are.if they are competing in open competition, Olympics or world champs. What matters is the systematic cheating at under age Championships. Something must be done as our genuine underage runners have no chance and come away discouraged.